When Internet people get together to edit comics, the results are bound to be full of Unfortunate Implications. This Square Root of Minus Garfield strip is full of this. An earlier strip pointed out an in-universe one. This remix of Penny Arcade remix shows Gabe going insane and becoming a Brony after seeing the MLP:FIM cast on his front lawn. Now, Gabe is bi and frisky, and he apparently lives in Equestria, so imagine what would happen next. It got WORSE with this one, which practically CONFIRMED these implications. 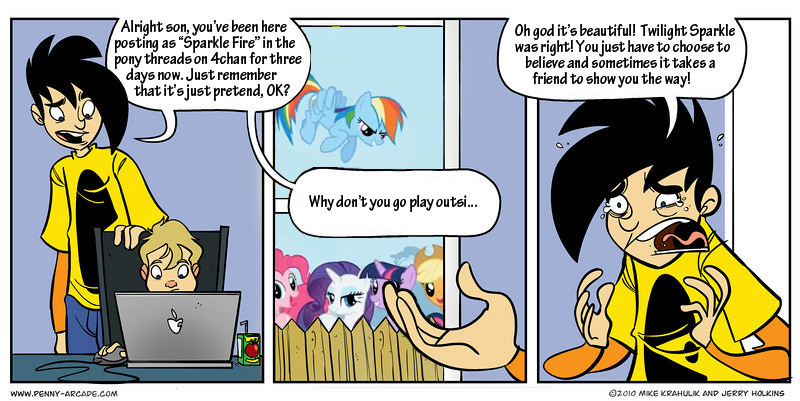 Then THAT got worse when real-life Bronies looked at it. This page was last edited on 15 April 2014, at 04:36.